I was just talking this week with colleagues about Carlsberg's 'Probably' campaign. Their more recent "there's always option C" - is fine, but I thought 'Probably' could have gone on forever. 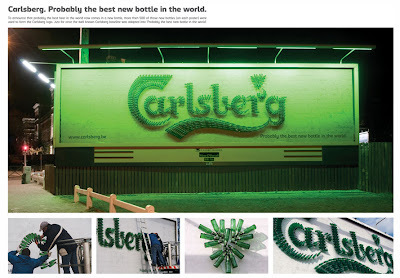 Their 'Carlsberg don't do litter' was up there among the finest ambient campaigns I've ever seen here. Above is an outdoor special from Carlsberg. You can see it is actually made of bottles. Thanks Fran from Made in Hollywood for sending on. I think if an advertising campaign passes into the vernacular, you can count it as a success. However, it can then become generic and bue sued by other advertisers in an oblique way; hence diluting it's effectiveness with regard to brand recognition. I would reference the Marks and Spencers Food adverts - used gloriously by Ceebeebies to promote "Big Cook Little Cook" . Not a commercial use but the beginning of a dilution of the M&S association. Take a google for a product called "Claytons" an alcohol free "mixer" promoted in Australia in the 70's and 80's by Jack Thompson. "The drink you're having when you're not having a drink"
"Claytons" is now part of the vernacular (meaning something that doesnt really work) but very few 20 year olds would know the provenance of the word.